If, as Larry Holmes claimed ahead of the Carlos Takam fight last November, Anthony Joshua would have sconed a peak Mike Tyson, what chance does Joseph Parker have tomorrow night in Cardiff? If only it were that easy; fighter A, who lost to D, beats fighter B. Fighter C whacks D, who lost to B, therefore fighter A beats C. You following? Don’t worry, boxing logic does not take the linear path. Holmes was biased to a degree, having been bounced by Tyson at the end of his career. How would Tyson have coped with a younger, active Holmes when that piston jab was at its most chillingly efficient? That’s one for the pub later. The Holmes premise was based on the kind of front-on threat Joshua offers, throwing big, powerful combinations off a productive jab. Tyson, coming up out of that crouch, would, argues Holmes, have been fodder for a big man with good movement. The devil’s advocate questions whether Joshua’s movement would ever have been good enough to becalm the raging Tyson during the Cus D’Amato Catskills period. Which brings us to Parker. David Price, fighting on the Cardiff undercard against Alex Povetkin, is right to advance the view that speed is of the silver bullet for the Samoan Kiwi. “Parker has got to try to frustrate Joshua for the first six rounds and box on the back foot, circle around him, and try and dart in with his fast feet and land some quick shots on the way in,” Price said. Joshua talks of setting traps for Parker, of adding variations to his muscular attacks. 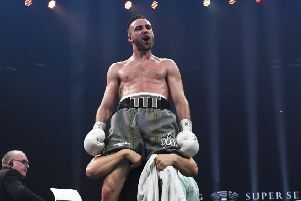 He is in his tenth year as a boxer, completing a successful Olympic cycle against the best amateurs in the world before turning over in 2013. With 10,000 hours under his belt we are unlikely to see much that we have not seen before, which means he is probably stuck with the flaws as well as the strengths. The great Barry McGuigan notes how Joshua still falls episodically into the trap of fighting like he is peeping over a fence, in other words with his chin exposed. For a demonstration of that check out the knockdown executed by Wladimir Klitschko 11 months ago, crashing a big right hand through the guard in the sixth. Either the left hand is too low or, when throwing out the jab, the chin is too high. Klitschko was good enough and big enough to expose the weakness. Joshua was also wobbled by Dillian Whyte in a domestic adventure that turned into a rough-house brawl. Joshua allowed Whyte to dictate the rhythm, to make it a messy, ill-disciplined show of machismo. That lowered Joshua’s guard still further. Ultimately neither Klitschko nor Whyte could not repel the stuff that Joshua is brutally good at, unloading the power shots either at distance or in the wheelhouse. For a big man that uppercut is one tidy tool. To win, Parker will have to walk through the storm at some point. We know Joshua can survive a crisis, which is a skill in itself. Parker has yet to demonstrate that quality. We also know that Joshua has the temperament to handle the big occasion. This is only the second time Parker has fought outside New Zealand. He might train in Las Vegas but the emotional tension in Cardiff will be of a higher order than anything he has experienced thus far. The truth is there are too many unknowns about Parker to properly assess the scale of the threat he brings. What we do know is he holds the WBO heavyweight belt, believes sincerely in his ability to win the fight and at 6ft 4in and 17st-plus has the size to trouble any chin on earth if he connects with purpose. Following operations on both elbows last November his trainer, Kevin Barry, says Parker is hitting harder and faster than ever. All good stuff, and a theory that will be thoroughly tested under the roof of the Principality Stadium.